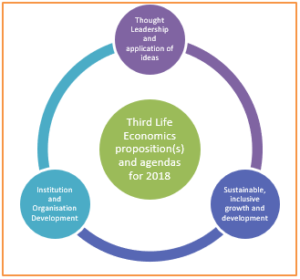 Third Life Economics - Porfolio of work that David Marlow has undertaken. The 3LE portfolio has evolved significantly over time. Major themes and interventions for each year from 2009 – 2017 are detailed in the hyperlinks below. What does “Doing interesting, innovative work with stimulating people and institutions” mean in practice? How is it playing out currently, towards 2020, and beyond? I deploy tools and techniques of economic and institution development to plan and manage change – strategic and operational. I work with clients to build relationships, profile and reputation, and to deliver interventions effectively. For local and regional leadership teams, navigating though the complexities and chaos of global and national politics needs to be underpinned by intelligent consideration of strategic choices. turning analyses into well-conceived intervention strategies and action plans. Building on the long term strategic planning for the Overseas Territories (OTs) of Anguilla, British Virgin Islands (BVI) and Turks and Caicos Islands (TCI) exercise I led in the aftermath of Hurricanes Irma and Maria to consider how the tools and techniques of crisis management and turnaround might be useful for places in the current tumultuous political, economic and social landscape. Visiting Professor of Practice at CURDS, Newcastle University – working in all three thematic areas outlined above – thought leadership, industrial and inclusive growth, institutional strengthening – with a special interest in ‘civic universities’ as part of the 3LE ‘anchor institution revolution’ proposition. I am a regular speaker, facilitator and participant at conferences, events and workshops – these episodes being integral to the work and most of the projects described above. This would not be a 3LE portfolio, though, without relating all my professional practice to the wider political and societal changes driving the breakdown and break-up of the UK. My personal blog provides the outlet for my exasperation with our politics and the non-dom elites that control it, with the rise of fake-truth populism in the UK and globally, and with the seeds of a progressive fightback. This has, on occasion, cost me clients and revenue – see in particular the ‘Sun and Shadow’ blog in the aftermath of the 2015 General Election. But my work and 3LE will never be solely a purveyor of technocratic, machine consultancy. Nor will I ever articulate in a personal capacity anything that will prevent my total professionalism on formal pieces of work. If I have any belief in Britain, it is in the energy and dynamism of local places when guided by strong and inclusive leadership equipped with devolved powers and resources. When we work together you will get my passion for and commitment to our shared agendas – a technical rigour, shaped creatively, with political understanding and sensitivity.